Even after 57 books, Kelli Jae Baeli always tries to write the sort of book she would want to read. She says her favorite thing to do is take a common trope and turn it on its ear. Where you expect a zig, she gives you a zag. In her pages, you will find strong female characters, ethical dilemmas, realistic romantic storylines often filled with adventure and intense pacing, tempered by witty dialogue, and happy endings. All are hallmarks of her work. Kelli Jae Baeli is the author of 57 books, 29 of them bestsellers. At the end of 2017, she and her wife, Melissa, will begin a journey around America, visiting all 48 contiguous states with a travel trailer in tow, taking pictures, writing novels and travel articles and enjoying all this country has to offer. 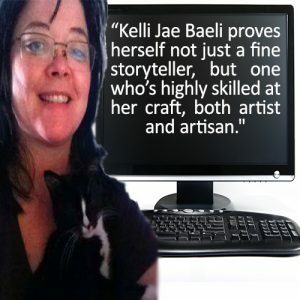 Indie Publisher and author of 29 bestsellers, Kelli Jae Baeli enjoys a sales position in the top 5% of lesbian authors. Her writing career began as a child, and that interest in expression through words on a page blossomed into full-length works, when she became frustrated with early examples of lesbian fiction, and decided to write something she would want to read. She’s been doing that ever since, authoring and producing 57 books, both non-fiction and fiction, in a variety of genres, and for both gay and straight readers. Constantly mining the world around her for literary tidbits, Baeli is always to be found with iPhone in hand, recording or thumbing in notes, a self-confessed story magpie who sees everywhere the fodder for her work. Creativity comes as easily as breathing to Baeli. A talented singer-songwriter with over 200 songs to her credit, she also loves mixed-media art, painting, pottery, and clay sculpture, as well. Living a life around words, books, art, and music not only fulfills her, but defines her. She’s been an Indie publisher and author for 28 years. Formerly a managing editor for two small presses, she founded Kindred Ink Writers Initiative, Kind Red Ink Editing, and currently publishes under the imprints Indie Literati Press and Lesbian Literati Press. Believing in mastering every aspect of the business, Baeli does her own marketing, book cover design, typography, and formatting, and is also an editor, webmaster and blogger, all after eight years of University, to include pursuing a B.A. in Professional Writing & Editing. A canny mix of businesswoman and artist, Baeli is delighted to spend each day relentlessly polishing her skills and feeding her muse. She currently makes her home on Holiday Island, near the quaint village of Eureka Springs with her wife, Melissa Walker-Baeli. I am a 59yo male hetero and I can honestly say that I love your work. Your characters are very “human” and down to earth. I just this second finished “As you were” and was not able to put it down. Tru and Brittany came across as if I was friends with them in real life. Fantastic. Steve, I thank you for such a sweet comment. In my work, I have always wanted to break through the confines of “this is a book for lesbians” and into “This is a book for PEOPLE.” I’m sure I have many other “lesfic” books you might enjoy, but I also have several mainstream books. Currently, I am working on my first post-apocalyptic book (Apocalyptic Women: All Bets Are Off) and recently released a prequel novelette for that work (Juvie: True North) that is even in the YA category, which is my first one in that genre. It was an accident. LOL. Anyway, I’ve always believed that many men would enjoy my work, (and some have let me know that they DO follow me) and I’m glad to see that this was true for you, as well. Please stay in touch, and I hope you will let me know if you read another of my books. Thanks again, Steve. I found your writing on Kindle by searching for mysteries with a strong female character. I almost always go through my searches (usually mysteries and sci fi/fantasy) and center on female authors, as I find them generally more interesting in terms of characterization and interpersonal relationship dynamics. I’ve read many of your books, and just discovered your blog here. I find that your writing makes me a better person, in that you dangle insights into my hetero life in the guise of lesfic that compel me to rethink a great deal of my preconceptions about women in general, and most specifically, my wife, my daughters and granddaughters. AKA #6, for example, in its portrayal of the banding together of the DPD … I initially rejected the premise that all the males would band together in that manner and then began re-thinking. I live very near Ferguson, MO, and I started thinking about what you were portraying in the light of race issues here in the St Louis metro area. I re-thought, re-evaluated, and re-jected my initial rejection. Your works entertain, and for that I thank you. They also educate and maybe, just maybe, soften and humanize even old farts like me. Jim–thank you so much for your comment. Sentiments like that are so valuable to me, so validating. Oddly, i was writing a blog about that very subject, when i came across your comment. I hope you don’t mind that I quoted you. (Fiction as World-View). I love knowing that I have male readers, and for the reasons you say. Again, please know that i appreciate you and the time you took to drop me a line. Best to you and yours. I have just discovered your works! I always hated reading lesbian fiction… Because it was always so… Banal? And really, just that.. Fiction. I moved to Joplin, Mo in March of 2011, to reconnect with the love of my life… Again… at the time it was a 32 year ridiculousness, mostly from my inability to change or grow as a human. Lots of inability to change, and many other issues, the last 4 years since the Joplin tornado, I still find myself here trying to be better. Your Jobeth and Phoebe characters run a ridiculously similar pattern to mine and my partners life that are eerie. Maybe I should write a book, lol.I just wanted to say that I found your work thus far awesome! I love Eureka Springs and am very glad you found comfort and goodness in your new home. Hi I have just finished all 3 of the rainfall books they are fantastic thank you. Will there be more to follow. I just finished book 2 in the Rain Falls series and am about to start the 3rd. I have become a huge fan and can not wait to read the rest of your work. I am an avid reader as it is and these books have made me more so. You truly bring your characters to life and they feel like old friends. I stay at home full time to take care of my grandmother with Alzheimer’s so I am unable to get out and meet people,reading is what keeps me sane. Thank you for the hours of enjoyment and bringing some joy to my world. Hello i just discovered your work last weekend and am now on #8 Ive read the 3 rainfalls,pit and am now on #4 of aka love them all. Thanks for sharing your talent. i was entranced by your wonderful books. "My problem is having TOO MUCH to write about. I don't suffer from writer's block, it suffers from me."